Steamed Pumpkin Flower Rolls is a type of Chinese steamed buns. These buns are without filling and are normally eaten plain. Pumpkin paste which is bright orange colour is used to create something bright and pretty for these flower rolls. These Steamed Pumpkin Flower Rolls are made specially to celebrate the coming Chinese New Year and they are exactly what I am looking for … they are pretty, incredibly light, moist and fluffy in texture and so delicious. Having them for the Chinese New Year is believed to bring prosperity or good luck too. These Steamed Pumpkin Flower Rolls are surprisingly easy to make, only it may take a bit of time waiting for the dough to rise. But the actual work involved is quite simple. First, just combine all DRY ingredients in a large mixing bowl. Then add the WET ingredients and knead till you get a smooth dough. Divide the dough into small pieces and shape into flower shapes. Next, set aside to proof till double in size. Then steamed and we’re done! 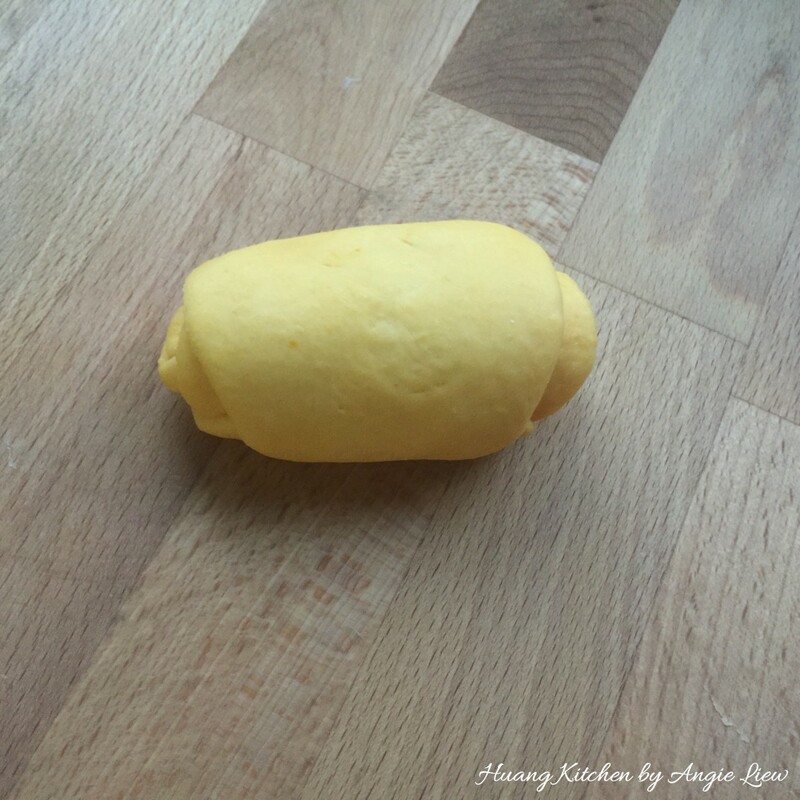 A special thanks to my dearest sister (Mui Khin) who took the time and trouble to share with me this lovely Steamed Pumpkin Flower Rolls recipe. Without her, these flower rolls may not turn out to be so amazingly beautiful. Thank you Ji Cher! A type of Chinese steamed buns, Steamed Pumpkin Flower Rolls are without filling and are normally eaten plain. Pumpkin paste which is bright orange colour is used to create something bright and pretty for these Steamed Pumpkin Flower Rolls. 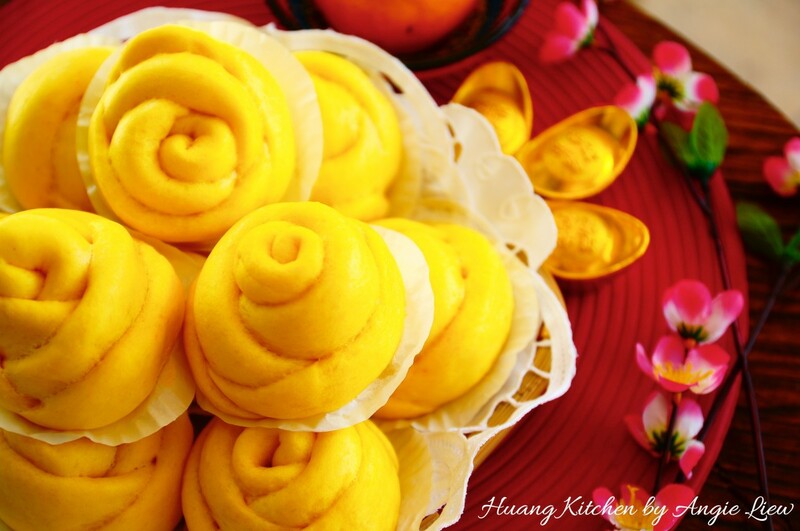 These Steamed Pumpkin Flower Rolls are made specially to celebrate the coming Chinese New Year. Pre-measure all ingredients needed to make these buns. In a large bowl, mix well all the DRY ingredients. Transfer the DRY flour ingredients to a large mixing bowl of a stand mixer and add in mashed pumpkin paste. Using a dough hook and on low speed, mix everything together. While mixing, slowly add in water and stir until mixture forms a slightly sticky dough. The amount of water added maybe less depending on how concentrated is the pumpkin paste. Next, add in the vegetable shortening. Continue to knead until the dough is soft, smooth and pliable (not sticky). Turn the dough out onto a lightly floured surface, knead slightly and divide the dough into two equal portions for easy handling. For each half of the dough, roll into a long log and cut into small pieces. To ensure the buns to be of the same size, weigh each dough to be of the same weight. I weigh the dough to 20g each. Roll each cut dough into balls. Using a rolling pin, flatten the round balls into round thin shape. Then arrange five flattened dough balls in one straight line, overlapping one another. Using a fork, press down lightly over the layered circles of dough at the joints to secure in place. Then, starting from one end, roll up the dough. Roll it into a Swiss roll. Once the Swiss roll is formed, just roll a little with the palm of hand to secure the seams. Next, using a pastry cutter or sharp knife, cut each Swiss roll into two equal pieces at the centre. Repeat to do the same with the rest of the flattened dough. You will have 34 flower rolls. 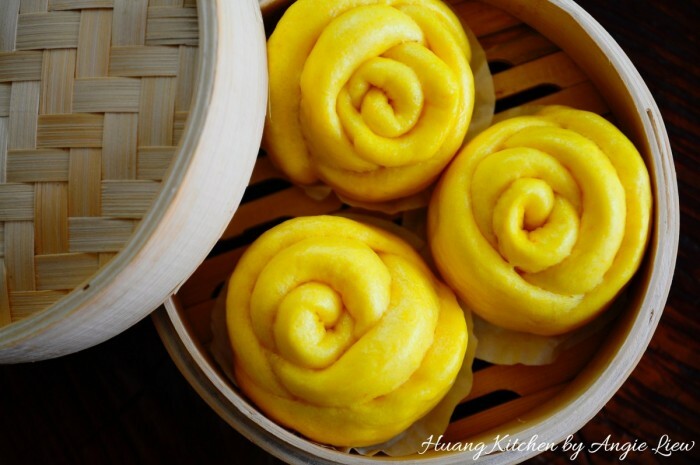 Place the rolled flower buns cut side down on paper cases and then place on a tray or bamboo steamer. Cover and set aside in a warm place to rise until doubled in size, about 20 to 30 minutes. Steam flower rolls, in batches, over high heat, in a large bamboo steamer set over a pan/wok of rapidly boiling water for 15 minutes. When done, off the heat but leave buns in the steamer for another 2 to 3 minutes before removing from steamer. This will ensure the buns will not shrink after cooling down. Remove the bamboo steamer to cool on wire rack. Then quickly transfer the steamed flower rolls to cool on wire rack. And we're done! Serve these soft and fluffy flower roll buns warm. As always, ENJOY! Pumpkin paste is made by first steaming the pumpkin with skin until soft. Then scrape the flesh and mashed the soft pumpkin flesh. As pumpkin paste has water retained after steamed, it is advisable not to add all the water at one go. These flower rolls is best served warm or hot. Store in an air-tight container and keep in refrigerator. Just steam for 2 to 3 minutes before consuming the next day. They can also be kept frozen in an air-tight container for up to 3 months. Just remove from freezer and steam for about 2 to 3 minutes before serving.